Taking care of your heart is integral to healthy aging. According to the Centers for Disease Control and Prevention, more than 27.6 million Americans – about 11.5 percent of the population – have diagnosed heart disease. The good news is heart disease can often be prevented – and even reversed – when people make healthy choices. That includes adoption of a healthy diet. February is American Heart Month, and it’s a good time to take a look at lifestyle changes we all can make to help fight cardiovascular disease. The National Institute on Aging explains that many of the problems older adults experience with their heart and blood vessels are not caused by aging, but are actually caused by preventable disease. And if you have risk factors such as high blood pressure, high cholesterol, diabetes or obesity, your chances of developing heart disease increase significantly. Eat a rainbow. Choose vibrant, eye-appealing ingredients, including fresh fruits and vegetables in an array of colors. Generally speaking, the more color, the more vitamins and antioxidants. Choose lean cuts of meat. Cut away excess fat from beef and pork, and remove the skin from poultry before cooking. Fold in flavor. Aromatics such as garlic and onion add flavor depth to any dish. Also try adding herbs, spices and lemon juice to season food instead of salt, butter or margarine. Use a low-fat cooking method. Choose steaming, broiling, poaching or grilling over frying. Or try a stir fry with just a little added oil or broth. There are plenty of creative ways to make a tasty, heart-healthy dish. The FirstLight team has assembled a collection of some of our favorites that can benefit your heart and overall health. According to Amanda, the two recipes she recommends are inspired by many FirstLight clients who prefer soft foods like mashed potatoes or soup. She also used to serve these dishes to her children when they were young. Peel potato, slice and steam or boil. Once cooked, mash and stir in salt and margarine to taste. Mix well. Peel and rinse the onion and chop. Heat olive oil in pan and stir fry onion for a few seconds until fragrant. Stir in ground pork and add white cooking wine, soy sauce, stevia/honey, water and cornstarch. Stir fry evenly and quickly. If serving green beans on the side, cook them in water or steam until well done. Put the potatoes on a plate and drizzle the pork mixture on top. Garnish with cherry tomatoes and serve with a side of green beans. Cut meat into small pieces and blanch to clean. Rinse and cook in the boiling water and cooking wine for 40 minutes. Peel carrot and potato and dice. Add to soup, cooking until well done or tender. Rinse and chop the cabbage. Add to the soup mixture and cook until cabbage is soft. Add salt to taste and cornstarch solution to thicken. Preheat oven to 350 degrees. Cut the pita breads in half and set aside. Shred the cheese and mix well with the garlic. Sprinkle the dried basil over the shredded cheese. Divide cheese evenly between the 8 pita halves, about 2 TBSP per pita bread. Place pita breads with cheese on a flat pan, cookie sheet or aluminum foil and bake for 5 minutes, until cheese melts. Carefully remove from heat. Put onto plates and serve with tomatoes, cucumbers and green onions. Pro tip: You may wish to make these in batches to keep the cheese melted and prevent the bread from getting hard. According to Rebecca, this is her favorite recipe! Lightly spray a Dutch oven with cooking spray. Add the oil and heat over medium-high heat, swirling to coat bottom of pan. Cook onion in oil for 3 minutes, or until soft, stirring occasionally. Reduce heat to medium. Stir in turkey and cook for 5 minutes, or until browned, stirring frequently to break it up. Stir in garlic, chili power, pepper and cumin. Stir in remaining ingredients except for green onion. Cook for 5 to 7 minutes, or until heated through, stirring frequently. Just before serving, top with green onions. According to Stephanie, this is a wonderful, heart-healthy, low-carb family dish. Pro tip: A package of low-sodium taco seasoning can be used in place of the spices listed in the ingredients. Preheat the oven to 350 degrees. Slice the spaghetti squash in half long ways. Sprinkle with salt and drizzle with olive oil. Bake for 45 minutes. Sauté the onion in a tablespoon of olive oil for 2 minutes. Add bison or turkey. Cook until done. Add spices. Mix in beans, tomato, salsa and lime juice. Simmer for 10 minutes. When spaghetti squash is done cooking remove seeds and scoop out pulp. Place on several layers of paper towels and squeeze out extra moisture. Place in a glass baking dish. Add meat mixture and top with cheese. Place under a broiler for a few minutes, until cheese is melted. Want more heart-healthy recipes? Check out the American Heart Association’s website for culinary inspiration. 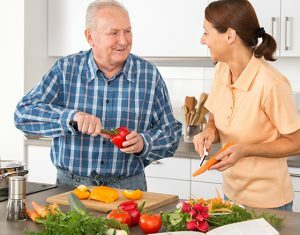 If you or a loved one needs help preparing heart-healthy meals, FirstLight Home Care’s Companion Care Services can help. Some older adults fail to get adequate nutrition simply because they can’t or don’t want to prepare a meal and clean up afterward. Our FirstLight caregivers can prepare regular meals that help you or a loved one maintain a healthy diet, provide sufficient nutrition for the application of medicines and simply add joy and comfort to an older adult’s day. Plus, our caregivers can handle the clean up! Find a location today to learn more. And follow us on Facebook for more healthy living tips. These are some amazing tips, especially about changing up your diet to help with the heart disease. I particularly like the suggestion to eat lots of fruits and vegetables with different colors. After all, the more antioxidants and vitamins that your body has the better.